Popular web browser producer Mozilla release its open source Firefox 10 which can download for Windows, Linux and Mac versions. 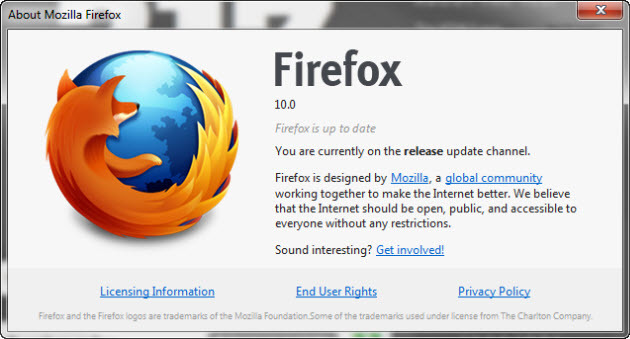 Mozilla Firefox 10 is optimized to handles its add-on updating and special features for web developers. Firefox 10 contains a gaggle of new capabilities and tools for web developers. For general users, it proved an upgrade adds-on update facilities which make the browser faster than previous version. Firefox 10 version also designed to offer 3D graphics capabilities for gaming and other applications. Web developers can run their web apps in full screen mode to get better performance on their jobs. To know more about Mozilla Firefox 10, you can visit Mozilla’s Homepage or for direct visit their Download page .